"They're soft, absorbent, and come in a variety of colors and sizes." "Reviewers gave these towels top marks for softness and absorbency." "They're 100% Egyptian cotton and come in a staggering 60 colors." "Reviewers say they're very absorbent despite their thickness." "This set is lightweight, dries quickly, and actually absorbs moisture." "Made with organic cotton and Lyocell Tencel"
"They look good and dry quickly." "Thick, soft, and absorbent, but not too expensive." "It feels like wrapping yourself in a cuddly blanket when you dry off." "High-quality towels in 24 colors." "Dries within an hour or two and can soak up a ton of moisture." "This set includes four bath, four hand, four fingertip, and 12 washcloths." Many experts have ranked these towels as the cream of the crop and for good reason—they're soft, absorbent, and they come in an array of colors and sizes. These 100% Turkish towels have a GSM of 700 meaning they are plush but not overly so. They also won't break the bank at this level of quality. Many reviewers say that these towels have lasted for many years in their busy household and they continue to come back to shop for more. They come in towel, sheet, hand towel, washcloth, fingertip towel, and bath rug sizes so you can outfit your whole bathroom. You can also add a monogram for a personalized touch. Made in the U.S. using eco-friendly, 100 percent organic cotton, the 1888 Mills Organic Cotton Bath Towel is a good option for anyone who wants a greener, pesticide-free option for toweling off. Aside from being eco-friendly, reviewers give their 1888 Mills Organic Cotton towels solid marks for softness and absorbency. Reviewers say they’re weighty enough to feel good on the skin, but not so thick that they stay damp forever or take up too much room on a shelf or in the dryer. Many also say they lack any sort of chemical odor that plagues other new towels. Some are disappointed with thickness, however, and a few complain that they are not “oversized” as billed by the manufacturer. The 1888 Mills Organic Cotton Bath Towel is 30 by 54 inches and weighs about 21.5 ounces. It’s available in five colors: white, earth brown, leaf green, stone gray, and water blue, although some of the popular colors have a tendency to sell out. Hand towels and washcloths are also available. These towels can be washed and dried normally, but some reviewers say they snag and fade easily. The Portuguese-made Abyss Super Pile Towel isn’t easy on the wallet, but it is heavenly on the skin, reviewers say. It should be a strong contender for anyone who’s willing to spend big on a luxury towel that will last. Owners say the Abyss Super Pile Towel has a few unique touches that set it aside from competing luxury towels, including softly rounded edges and oversized cotton loops that boost softness and absorbency. These towels also start off feeling great—no “break in” period or repeated washings required—and are a relatively hefty 700 GSM, or about 1.5 pounds. Abyss Super Pile Towels are 28 by 54 inches. 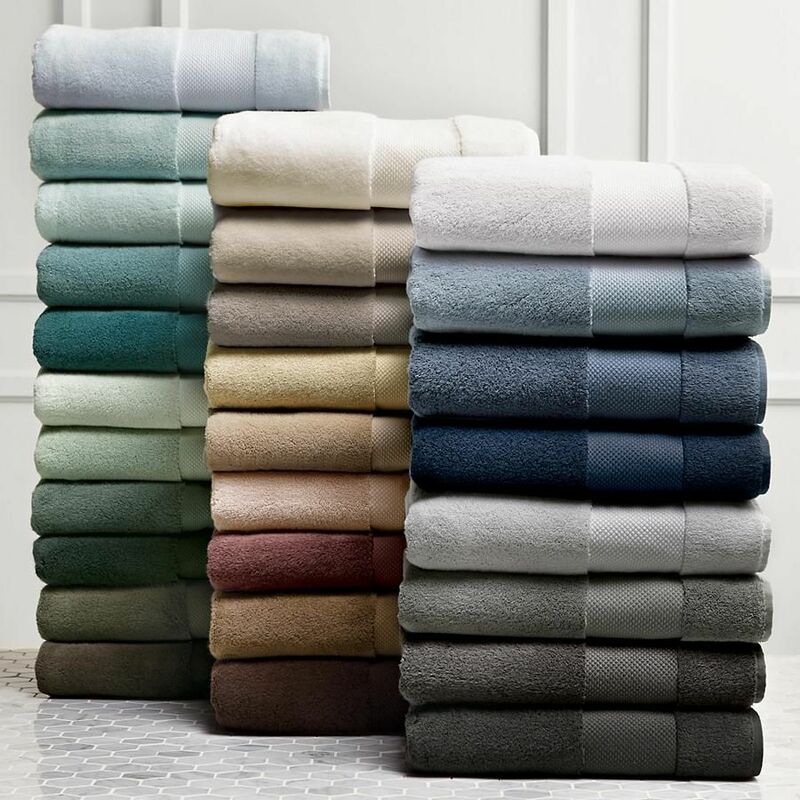 They are 100 percent Egyptian cotton and come in a staggering 60 colors, ranging from white, gray, and tan to saturated hues including lime green, hibiscus pink, and peacock blue. They are prewashed and preshrunk, and some reviewers say they have Abyss towels that are still going strong after several years. Washcloths, fingertip towels, hand towels, and two sizes of bath sheets are also available. The Pinzon Luxury 820-gram Bath Towel is our pick for the best heavyweight, plush towel out there. It's a solid choice for anyone who prefers buying towels individually instead of in sets of two or more. Again, these aren’t lightweight towels at nearly 2 pounds each, and they feature dense two-ply yarns that are meant to last longer than their single-ply counterparts. Reviewers say they are very absorbent despite their thickness, and most love the generous size. Some are disappointed with softness, however, while others note that there is some shedding, especially at first. The Pinzon Luxury towel is 100 percent cotton and comes in blue, gray, sage green, ivory and white. It measures 30 by 56 inches and has a simple pique border. No special care is required, but like most thick towels, it may require some extra time in the dryer; reviewers caution that this towel stays damp for quite sometime when air-dried. If you're not looking to spend a bundle this 3-piece towel set from Amazon gives you a bath, hand and washcloth all at a bargain price. And just because you're paying discount prices doesn't mean you are sacrificing quality, this set is made with 100% cotton, is lightweight, dries quickly and actually absorbs moisture unlike other competitors. The bath towel measures 54" x 30" with the hand towel coming in at 28" x 16" and the washcloth 12" x 12". The set is available in eight colors from a white to a bold purple so you're sure to find something that matches your style. If living an organic lifestyle is important to you and your family you might want to consider using organic cotton towels. Pottery Barn has a plethora of organic towel options that range from relaxing and spa-like (like these) to more patterned varieties. This towel is made with organic cotton and Lyocell Tencel which uses materials from responsibly managed forests that use 99% of all waste so almost everything taken is used to make these. These are also GOTS-certified so you can be sure that the towels you are buying are really organic. These are constructed with a 500-GSM so they are nice and plush. The colors are a beautiful mix of pale shades that evoke the feel of sea glass. These should be machine washed in warm on the gentle cycle. No harsh chemicals should be used and any face products with chemicals might discolor these. Turkish towels or Fouta's are all the rage right now. They get a lot of attention because not only do they look good they are quick-drying so you don't need to worry about mildewy towels. Parachute makes some beautiful Foutas that are made of 100% Turkish cotton, highly absorbent, and have a minimal style that could work anywhere. What is great about these Turkish towels is they have a flatweave on one side and then a terry texture on the other, as opposed to most Turkish towels which are just a flatweave. This still gives the user that "bath towel" feel they've become familiar with in a still quick-drying format. The Superior 900 Gram Egyptian Cotton Bath Towel is everything most people want in a bath towel. According to reviewers it is thick, soft, and absorbent—but still not too expensive. Because this towel comes in enough colors to match any bathroom, it’s also a good option for anyone who’s bored with basic white. Owners compare the Superior 900 Gram Egyptian Cotton Bath Towel to a plush towel in a high-end hotel, calling them dense and luxurious. And unlike some thick towels that just push water around, these towels actually absorb moisture nicely. A few reviewers grouse that they actually find the towels a little too heavy at around 2 pounds each, cautioning that they aren’t towels you’ll want to tote around, but most love their hefty, weighty feel. Measuring 30 by 55 inches this two towel set is available in at least 18 colors, including traditional hues like white, stone, and charcoal as well as brighter ones like red, teal, sea foam, and forest green. They are 100 percent Egyptian cotton, and reviewers say they’re easy to machine wash and dry. Like most thick bath towels, they do require an extra dryer cycle to dry completely. If you are looking for that spa-like luxury experience in the comfort of your own home you might want to opt for an extra-plush towel that feels like wrapping yourself in a cuddly blanket when you get out of the shower. This pick from Brooklinen is made of 820-GSM so it is quite heavy and absorbent. It comes in four different colors and in a set of two, though you can also buy these in a more comprehensive set or in a bath sheet size. Reviewers comment that these really are that thick and plush. A few have said they take a few washes to get the lint out and some say the drying time on the towel rack and in the dryer can be a bit long. But if you want a plush towel that is pretty much a given. Finding the right color towels to match your bathroom's decor can be a bit of a challenge. Many of the top manufacturers only sell towels in a few limited colors so finding something you have your heart set on can be tiresome. Thankfully The Company Store makes high-quality towels in 24 colors! Go for bold with the sorbet color or evoke your latest beach trip with lagoon—you've got a lot of colors to choose from so you can mix and match if you have multiple bathrooms. Besides having a stellar color selection these towels have a 620 GSM so they still are plush. They are made of 100% Turkish cotton and have a decorative dobby stripping. The Company Store says that these will have to be washed a few times to remove all of the lint, so just be warned. Plush cotton towels feel great on damp skin, but they can take a whole day to dry, especially when left hanging in a steamy bathroom. The Fina Ultra Absorbent Waffle Weave Towel dries within an hour or two, owners say, and it can soak up a ton of moisture—10 times the towel’s weight in water, according to the manufacturer. One of the biggest downsides of microfiber towels is that they don’t glide over skin as easily as cotton. Reviewers say that’s true with this towel, though it’s easy to blot away moisture instead. And while the Ultra Absorbent Waffle Weave Towel isn’t as soft as non-microfiber bath towels, most owners say that what you give up in feel you gain in utility—in this case, an extremely fast-drying, lightweight towel that folds much more compactly than a traditional cotton towel. Those qualities make it ideal not just for home use, but for toting along to the gym or on camping trips. Many owners also love using it specifically to wrap their hair. Available in white, linen, coffee, and sage, the Ultra Absorbent Waffle Weave Microfiber Bath Towel is 29 by 55 inches and weighs about 13 ounces. It is 80 percent polyester and 20 percent nylon. Owners say the towel saves space in the washer compared to bulky cotton towels and dries very quickly in the dryer. Looking to stock a house with towels for four? Look no further than this 24-piece set from Baltic Linen which comes in ten colors including a serene thyme green to a bold a bold deep plum. This set includes four bath, four hand, four fingertip with fringe (for display) and 12 washcloths giving you a complete setup at a very reasonable price. Reviewers love the price, though some note they are a little thin and produce a lot of lint after their first washing. We bought three top-rated bath towels and our reviewers tested them by using them every day for weeks on end. We asked our testers to consider the most important features when using these bath towels, from their size to their drying time. We’ve outlined the key takeaways here so that you, too, know what to look for when shopping. Size Not all bath towels are created equal in terms of size. Standard-size bath towels measure anywhere from 27 to 30 inches wide and 52 to 58 inches long. Larger towels, on the other hand, measure 35 to 40 inches wide and 60 to 70 inches long, but these tend to come with higher price tags and longer drying times. Absorbency The absorbency of a towel is determined by a variety of factors including fiber material and GSM (grams per square meter). If you want an ultra-absorbent towel, check out cotton or cotton blend towels that have a GSM of more than 600. Microfiber towels are also highly absorbent but lack the plush feeling associated with thick, fluffy bath towels. 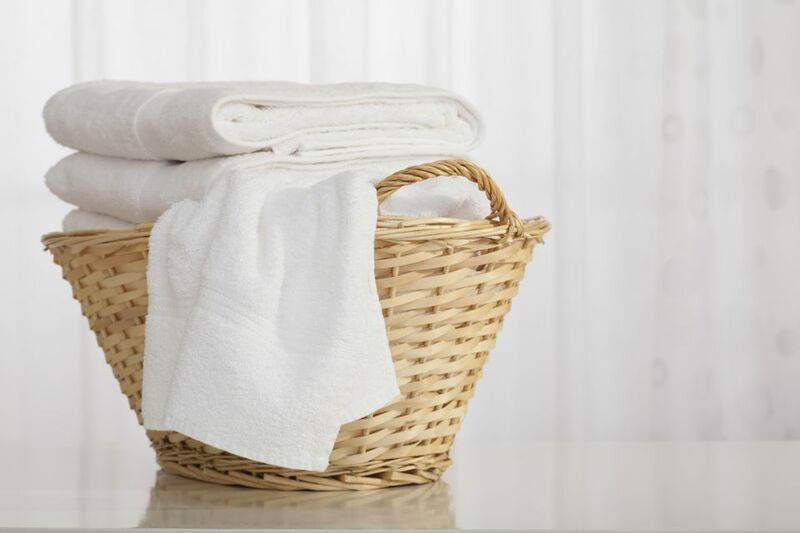 Drying time Thicker towels may sound luxurious, but consider whether or not you’re willing to endure longer drying times. Oversized bath towels may require an extra-long cycle in the dryer and tend to stay damp longer when hanging in the bathroom (which can be a problem if you don’t have adequate ventilation). Microfiber towels dry faster, so make that a priority if you can’t stand damp towels. This towel earned major points for its high-quality material, which one tester said was the “perfect combination of thick and soft.” One of our reviewers also thought it was warm: “My apartment can sometimes get drafty,” she explained, “and this towel kept me toasty right out of the shower.” Another highlight was its durability — one tester reported that it didn’t show any signs of wear and tear over the testing period, including after being washed. On the other hand, according to one reviewer, its thickness made it tougher to fit on a rack with other, thinner towels. It also made drying time a bit longer: “On the few occasions where it got soaked with water in places — when I was drying my hair, for example — it was less quick to dry,” noted one tester. “I liked this towel’s absorbency the most,” declared one of our testers. “It completely dried me off and had enough dryness to continue using through my morning routine when I applied makeup and washed my hands a few times.” One reviewer also liked its thickness and size: “It was large enough to not be completely soaked after one use and I could easily wrap it around my body with length to spare,” she said. In terms of negatives, one tester was disappointed in its durability: “I don't think the quality held up in the washing machine,” she said. “It looked ragged after just one use and wash.” Our reviewers also noted that it was heavy.